It is standard practice in breast cancer screening and staging that where there is a suspicious or unclear mammogram and ultrasound, a biopsy sample will be taken and given a histological evaluation. In addition to looking at the characteristics of the cells themselves, the pathologist will likely stain the sample looking for certain ‘biochemical markers‘. Many of these markers are proteins, which are released as cells change, die, or grow. Gross cystic disease fluid protein-15 (or GCDFP-15) is one of these markers, and tends to be a strong indicator of malignant cell processes commonly associated with breast cancer. I just want to let you know that we have created a newer version of this page with more up-to-date information on Gross Cystic Disease Fluid Protein (GCDFP-15). I recommend you to check it out! However, this page is still pretty great for research material. GCDFP-15 is one of a group of three distinctive proteins, named according to their molecular ‘weight‘ in kDa or kilodaltons, which include GCDFP-44 (also known as zinc alpha2-glycoprotein), GCDFP-24 (also known as apolipoprotien-D), and GCDFP-15. (actually, GCDFP15 is ‘misnamed‘, as its molecular weight is 17 kDa, not 15). These particular proteins are almost always present in the fluid of breast cysts and other benign fibrocystic breast diseases common in premenopausal women. More specifically, studies have shown that these proteins tend to be associated with cysts in which there is some kind of ‘apocrine differentiation‘, or some specific cellular activity associated with apocrine epithelial cells in breast duct tissue. (Apocrine cells are secretion cells, very common in skin and salivary glands, but there are some in breast epithelium as well. They help secreted the milk from the glands and into the ‘lumen‘ or empty space of the duct). Apocrine metaplasia and apocrine ademona are two kinds of benign fibrocystic changes, which will almost certainly stain for GCDFP-15. The image below shows the red-staining GCDFP-15 occuring on some of the breast tissues. Overall there are quite a few peculiar cells and quite a lot of cytoplasm. There also appears to be quite a bit of variety in the shapes of nuclei. This would be a typical finding in a breast cyst with a certain amount of cellular change with apocrine differentiation. However, mammogram and ultrasound studies may have ruled out the likelihood of a benign fibrocystic breast lesion, and point towards neoplastic cellular activity. (If the images suggest solid features or a mix of solid and liquid features, or perhaps irregular or random margins, that would be suspicious for breast cancer) So at that point, a biopsy will be called for, and the tissue sample will be tested for various bio-chemical properties (or ‘markers‘). When GCDFP-15 shows up in serum from a lesion which is not obviously a case of benign fibrocystic change, it becomes a strong indication of probable breast carcinoma. When GCDFP-15 is revealed in the staining of a breast biopsy sample, it is taken as one of a number of factors which point a conclusion of breast carcinoma. But there is some variability in terms of claims of the statistical prevalence of GCDFP-15 in breast cancers. While there have been no studies on a massive scale, some small studies have shown that GCDFP-15 is found in as much as 90-95% of confirmed breast cancer biopsies. Several other studies show somewhat less emphatic rates of GCDFP-15 ranging from 57% to 77%, so, one might infer from this that GCDFP-15 is probably found in about 2/3 of breast cancers, and is therefore a pretty strong marker for breast carcinoma. However, GCDFP-15 has a tendency to appear in small foci (here and there) and not throughout an entire lesion, so it is quite possible that a given biopsy sample will ‘miss‘ the GCDFP-15. For this reason it is said that GCDFP-15 has a high specificity (high correlation between what you find and what that finding represents), but rather low ‘sensitivity‘ (not very reliable because it is not always found, even when it is there). It would probably be prudent for a pathologist to test more than one sample. Mammaglobin is another ‘marker‘ protein which is now being used, along with GCDFP-15, in breast cancer screening. Mammaglobin is thought to be present in up to 60% of breast cancers. Mammaglobin has a greater ‘sensitivity‘ than GCDFP-15 (which suggest that is is more homogeneously spread throughout the lesion, and harder to ‘miss‘), but is not as specific. In other words, a finding of mammaglobin in serum fluid could indicate breast carcinoma, but could also indicate the presence of other diseases (The degree to which mammaglobin indicates breast cancer specifically is still being debated). So, the combination of staining showing mammaglobin with GCDFP-15 is a very strong indicator of confirmed breast carcinoma. There is some evidence to suggest that mammaglobin is associated with well-differentiated, hormone receptor-positive tumors, which tend to have a slightly better prognosis. As to the question of ‘why‘ gross cystic disease fluid protein -15 would be present in a breast cancer lesion, the most commonly held view is that they are brought on by certain hormone imbalances. Specifically, it is thought that breast cancer cells are stimulated to release the GCDFP-15 through increased androgen and prolactin levels, and that high estrogen levels will inhibit its release. Research into the use of GCDFP-15 in breast cancer screening, staging, and treatment is really quite new. The fact that some breast cancer cells appear to retain the ability to synthesize and retain GCDFP-15 and related proteins is really quite unique. Larger studies on the presence and activity of these proteins comparing women with and without breast cancer will give a clearer indication of their properties and implications. Down the road, GCDFP-15 may be used to detect the very early presence of developing breast cancer, or to give information as to the predicted aggressive-metastasive nature of a breast cancer tumor. At the present time, there is no known advantage or disadvantage in terms of prognosis due to the pretense of GCDFP-15. Everything you need to know about Gross Cystic Disease Fluid Protein is listed in the above information… So if you need an answer to any specific question regarding this topic, just look above! 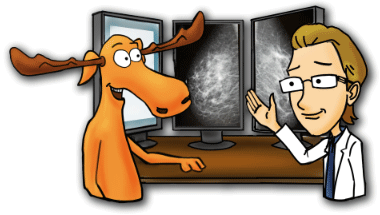 Or you could visit this page for more breast cancer screening types. Hall RE, Clements JA, Birrell SN, Tilley WD. Prostate-specific antigen and gross cystic disease fluid protein-15 are co-expressed in androgen receptor-positive breast tumours. Br J Cancer 1998 Aug;78(3):360-5.
cystic disease fluid protein-15 as a marker for breast cancer: immunohistochemical analysis of 690 human neoplasms and comparison with alpha-lactalbumin Hum Pathol 1989 Mar;20(3):281-7. Fiel MI, Cernaianu G, Burstein DE, Batheja N. Value of GCDFP-15 (BRST-2) as a specific immunocytochemical marker for breast carcinoma in cytologic specimens. Acta Cytol 1996 Jul-Aug;40(4):637-41. Monteagudo, C., M. J. Merino, et al. (1991). "Value of gross cystic disease fluid protein-15 in distinguishing metastatic breast carcinomas among poorly differentiated neoplasms involving the ovary." Hum Pathol 22(4): 368-72. Lerwill, M. F. (2004). "Current practical applications of diagnostic immunohistochemistry in breast pathology." Am J Surg Pathol 28(8): 1076-91. Mazoujian, G., Pinkus, GS., Davis, S., Haagensen Jr., DE. :Immunohistochemistry of a gross cystic disease fluid protein (GCDFP-15) of the breast. A marker of apocrine epithelium and breast carcinomas with apocrine features. American Journal of Pathology, Vol 110, 105-112. Bhargava, R., Beriwal, S., Dabbs, D.: Mammaglobin vs GCDFP-15: An Immunohistologic Validation Survey for Sensitivity and Specificity. American Journal of Clinical Pathology. 2007;127(1):103-113. Haagensen DE Jr & Mazoujian G 1986 Biochemistry and immunohistochemistry of fluid proteins of the breast in gross cystic disease. In Diseases of the Breast, edn 3, pp 474–500. Ed CD Haagensen. Philadelphia: WB Saunders Co.
Shiu RPC & Iwasiow BM 1985 Prolactin-inducible proteins in human breast cancer cells. Journal of Biological Chemistry 260 11307–11313. Murphy LC, Tsuyuki D, Myal Y & Shiu RP 1987 Isolation and sequencing of a cDNA clone for a prolactin-inducible protein (PIP). Regulation of PIP gene expression in the human breast cancer cell line, T-47D. Journal of Biological Chemistry 262 15236–15241.